LAHTI, Marjatta and MSHANA, Jackline and HAMWAALWA, Namutenya (2017) Libraries for social and economic change. Paper presented at: IFLA WLIC 2017 – Wrocław, Poland – Libraries. Solidarity. Society. in Session 112 - Poster Sessions. 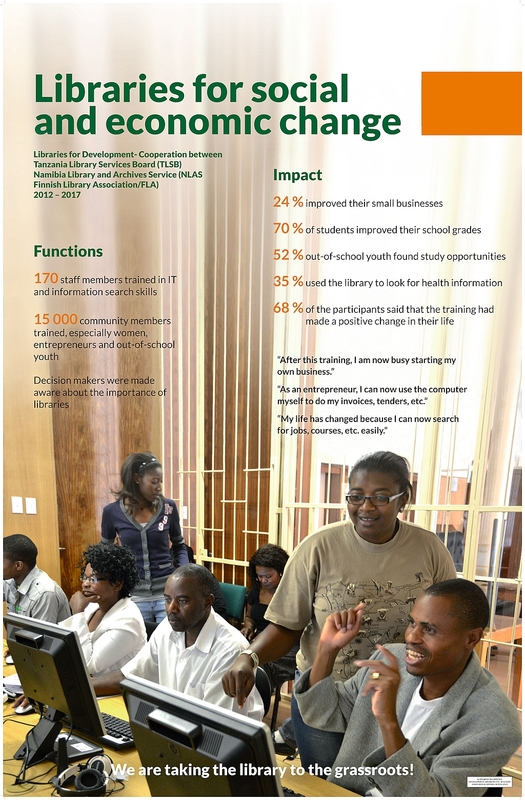 Libraries for Development - a cooperation project between Tanzania Library Services Board, Namibia library and Archives Service and Finnish Library Association started in 2011 and will continue until the end of 2017. In the framework of the project, services of the information society have been brought down to the grassroots level, and the results have been very encouraging. Libraries have helped the community members, especially women as well as out of school and unemployed youth to improve their lives. SME´s have improved their businesses after finding useful and relevant material, students have upgraded their academic performance and found further study opportunities, unemployed people have been able to look for and obtain work, and health information has benefitted community members. Decision makers have been lobbied about the importance of library services. The services have been in line with the poverty eradication programmes of Tanzania and Namibia. They also correspond with a number of the Sustainable Development Goals of UN Agenda 2030. The above results of the project, both quantitative and qualitative, are presented on a printed poster with a photograph, graphics and text, including anecdotes. A professional graphic designer has helped with the visual presentation.